Pomegranate syrup is a pretty simple ingredient which starts with juice and sugar. Pomegranate molasses is made with the same ingredients but reduced to the consistency of thick syrup. However, pomegranate molasses can also be made without sugar, depending on how sweet the fruits are. The juice is just boiled and reduced to about one third of the original quantity. It is pomegranate season again and when I saw some lovely pomegranates a few weeks ago at the farmers’ market, I couldn’t resist buying some. Actually when I bought them, I just bought them to eat them as a fruit or to use them in salads. However, it was the period when I was still working on the book and my husband was cooking most of the time, so I did not have any time for any fancy salads or even to peel and eat one. When I saw that the days were passing and no one was eating them, I had to act quickly before it was too late, as I hate to see anything wasted. I decided to make them into a pomegranate syrup or grenadine, as it is called. Pomegranate syrup is delicious. It is easy to make and you can use it in savory and sweet dishes. The usual way to make the syrup would be to extract the juice first and then make the syrup but that is quite messy. I think my method is much easier because I preferred to follow the method I make spoon sweets (fruit preserves), as I wanted to finish quickly. I boiled the pomegranate seeds with a little water and the sugar. While stirring I tried to squeeze out the juice from the seeds by pressing them with the wooden spoon or if you have a potato masher, that works even better. When it cooled, I then passed it through a thin colander-sieve and squeezed out any remaining juice with the spoon. If you think it is too much work, I can try and convince you by telling you that this syrup is so worth the effort as it is packed with 3 different kinds of polyphenols – tannins, anthocyanins, and ellagic acid – are present in particularly high levels in pomegranate juice, and have the most powerful health benefits. I make spoon sweets (fruit preserves) all the time, so I know how to make syrups and used one of my favourite flavourings which is the fragrant geranium leaves. If you simmer the syrup for a longer time (about an hour) until it reduces considerably, then you will get pomegranate molasses. However, I preferred to make the syrup, which needed less time. Before giving you the recipe for the syrup, I was asked by the Friends of Glass, from Belgium, who noticed that I often use glass jars to store in some of my recipes, if I wanted to become part of a project to promote the health and taste benefits of storing our food in glass. I gladly accepted because making jams and spoon sweets, pickles and sauces all the time, I always recycle bottles or jars from other products I buy. Unfortunately I did not have time to write about it at the time but it’s never late to bring awareness about recycling as this does not only benefit our health in the long run but also our pocket as after the international economic crisis, we have to find ways not to spend our money unnecessarily. Make a difference: Reduce, reuse, recycle. For every earthy reason don’t waste it!! I always use them when making glyka tou koutaliou (fruit preserves), jams, syrups, sauces, pickles, etc. A few weeks later I got an e-mail from them asking me to send them my address as I would get a package with a whole bunch of NOTHING in it!!! Weird, eh? Well, I did and guess what? It arrived just the right time when I was preparing my pomegranate syrup!! I was surprised to see on the package written in Greek “This box has NOTHING to hide inside” but also on the bottle and lable a similar message was also written in Greek. It seems that they customized each package in the language of the recipient’s country. Isn’t that cool!! I got a sauce bottle of NOTHING. However, in this bottle you can store about 350 ml of anyting you like. Just wash the bottle first and then you can use it to store creams, soups, sauces, fresh juices, stock, syrups etc. I later found out that they are giving away 10.000 bottles for free, so if you live in the European Union contact them if you also want one. Pomegranates take a lot of time to peel and deseed, if you don’t know how to do it properly. All you need to do it cut the rear end, where the flower opens so that you can see the various sections of the pomegranate, which are separated by membranes and cut along the membranes. Then cut the rear side (the one it hangs from the tree) and open it. Watch the video to see how easily you can deseed the pomegranate! Pomegranate syrup starts with juice and sugar and pomegranate molasses with same ingredients but reduced to the consistency of thick syrup. Peel and deseed the pomegranates. Separate the pomegranate seeds from the membranes. Add the seeds with the water and sugar in a pot and bring to a boil. Lower the heat and simmer for fifteen minutes, stirring with a wooden spoon, trying to squeeze out the juice. Pour the fruit through a very thin metal colander-sieve in another pot or bowl and squeeze out the remaining juice. Discard the seeds. Return the juice to the pot and bring to boil. Add the fragrant geranium leaves and simmer for about 10 minutes, until the syrup thickens and finally mix in the lemon juice. Cool to room temperature before bottling, after discarding the geranium leaves. I’ve tried this syrup on top of crepes, ice cream, waffles, creams, Greek yoghurt, cakes, in milk shakes, in drinks (cocktails), in savory recipes, in vinaigrettes, etc. This year I decided to make Pomegranate Molasses. My neighbour gave me some of her lovely pomegranates and there are also a couple of trees around the house, which however are abandoned and not watered so the fruit were small and the seeds not very ripe but nonetheless I picked them as the birds started eating them and it was a pity to see them wasted. Here in Assini, wherever you go you will find pomegranate trees and during our walks I love taking photographs. I have photographed them in all their phases of growing, from the time they blossom till the time they ripen on the tree. These yielded 11 cups pomegranate seeds. I put them in a pot with 1 cup water and boiled them for 10 minutes. I set them aside to cool and then passed them from a sieve. (Don’t through the seeds away but mash them in the food processor and use them on your face or body as a scrub, as a friend told me on Facebook). I measured the juice with water and I had 4 1/4 cups. I tasted it and it was quite sweet but not as much as I wanted so I added 1 cup of sugar. Unless your pomegranates are sour, the amount of sugar to add would be from 1/2 to 1 cup, depending on how sweet your pomegranates are. The addition of fragrant geranium leaves is optional but I like adding them as they give a lovely taste to syrups. The difference between a syrup and molasses is that you have to boil the syrup for much more time until it is reduced to a very thick syrup. So, I added the fragrant geranium leaves and brought the juice to boil, lowered heat to medium and simmered it uncovered for 1 hour, until it was reduced to half. You can see the mark on the pot when it was ready. Just before turning it off, I added the lemon juice. I use Pomegranate molasses in vinaigrettes, or in marinades instead of using honey, as well as in other savoury recipes as it provides a fruity and tangy flavor to these dishes. Pomegranate syrup is made the same way as the syrup but it is boiled a longer time, until it is reduced by 1/3. Peel the pomegranates and remove the arils. Put them in a pot with water and cook them for ten minutes. Set aside to cool and pass them through a sieve, pressing them to remove all the juice. Put the juice back in the pot together with sugar and fragrant geranium leaves and bring to a boil. Reduce heat and simmer for about an hour or until reduced to one third. Discard the fragrant geranium leaves and add the lemon juice. Set aside to cool and then transfer to glass bottles or jars. Oh, wonderful! I'd love some of that syrup on my pancakes. I have seen in Americanand UK blogs using this molases but we don't get them here and you have mentioned if you boil for a hour you get the molases. I am sure gonna try when i can get hold of the fruit cheaper as here you have to pay 1 € 50 cent more or less for on. That's quite expensive Finla. I wouldn't pay 1. 5 € for one pomegranate. I think in Greece the whole kilo which is 3 – 4 pomegranates costs about that much. Pomegranate syrup looks delicious. How long it can be stored. Is it has long shelf life. Grenadine looks fabulous, thanks for sharing..
Homemade grenadiine sounds so much better than the preservative-filled store-bought stuff. I have to try this! Months ago they said they sent a box of Nothing to me…but…still no sight of it. Love your quicker way of making grenadine. SUper! Our apologies for the delay of your Nothing sample. We had some problems with our distribution. That's why I had your bottle send to my desk so I can send it to you personally. I will take care of it this week. It's unacceptable you had to wait this long, I hope you will accept my deepest apologies. Nickias, I'll pass this message on to Angie. What a great way to make pomegranate syrup. I thought it would be a lot more harder Ivy! Thank you for sharing this and the bottle story! LOL! Perfect syrup Ivy. Especially with yogurt I would eat the whole bowl. Πολλά Φιλάκια, Καλό Μήνα! I love pom syrup! Very easy way to make it … thanks very very much Ivy for sharing … my kids will love this! I love this post! I try a lot of jams and syrup too and store them in glass recycled bottles. Wow I've always wondered how pomegranate syrup was made! 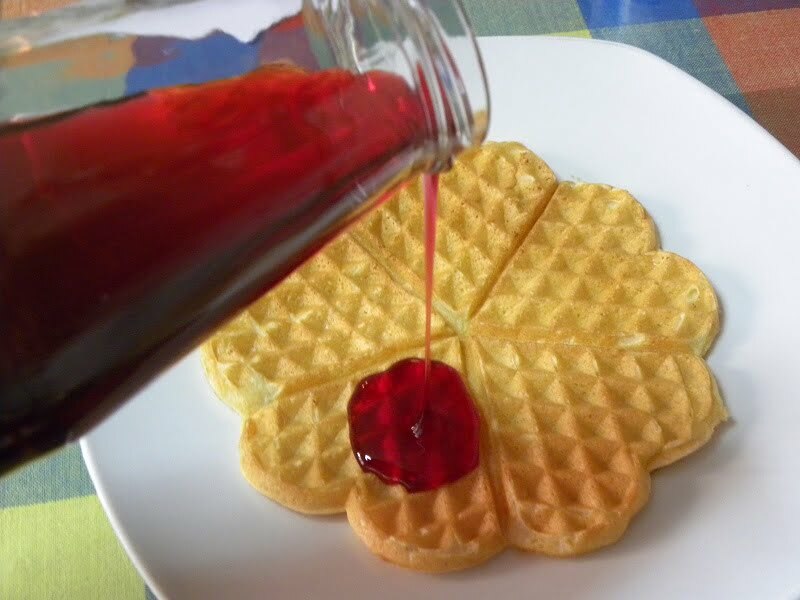 I love this post, your pomegranate syrup look sooo good. In Italy we call it "granatina." I love the color! Pomegranate juice has become so popular here that you can buy bottles of it at the farmers' market. This makes me smile, because when I was a kid, pomegranates were given to us as a gift from the farmer from whom we bought apples. My brother and I loved eating them, but I think we were the only ones. This has to be a treasure or jewel of the pantry. At 3 in the after I am salivating just looking at this. I must be going insane:-) really awesome Ivy. The grenadine that A uses for the drinks is just fake here, sugar syrup. I wish I could make some of this. Thanks for the recipe. I would probably start with pomegranate juice since that would be more economical here, do you think that would work? The fragrant geranium leaves are an interesting ingredient. I wonder if that is the same as the scented geraniums you can buy here. They come with all different kinds of scents like lemon, nutmeg, peppermint, and rose, I wonder which kind would be like what you are using? I have never made it with pomegranate juice but I do not see why it would not work. You will, however, have to ajust the amount of sugar added if the juice already contains sugar. I think that fragrant geranium leaves and scented geraniums must be the same. I didn’t know that there were so many different scents so it’s up to you to decide which one to use. Thanks for the recipe. It looks very easy and I now want to try and make some! I love sprinkling pomegranates on my salad as it gives it such a fresh taste and looks so good but your syrup looks fantastic. Must give it a try! Thanks for sharing, Its certainly better than those market hyped products..
As we know what we are serving. Wow, I didn’t know the difference between pomegranate syrup and molasses. Thanks for sharing! we usually eat the pomegranate seeds with sugar and liqueur. This is another good idea to consume the pomegranates. Thanks!